Tectonic plates meeting (convergent plates) form mountains. But if those plates change direction (which I am just assuming they can over time, I have no idea if it's true) and start pulling apart (divergent plates), will the mountains automatically crumble away as the plates split, or can some mountains become part of one or the other plate, like clay sticking to your hands when you remove them? Feel free to explain any prerequisite knowledge you feel I lack. This might be an important question to me. Quite the opposite. Divergent boundaries can cause mountain (well, actually volcano) building, because upwelling magma is part of the rifting process. First and most importantly, the Mid-Ocean Ridge can be considered the longest, most massive mountain range in the world. It's more obvious, of course, on continental rifts like the East African Rift. Mt. Kilimanjaro, a product of rift volcanism, is the highest mountain in Africa. Another famous locale of volcanism at a divergent boundary is Iceland, although a hot spot may play a role there. But BUT BUT it seems you want to know what happens to existing mountains. Some others have answered that only erosion destroys mountains, and that's mostly right, but only because it's a matter of timing. 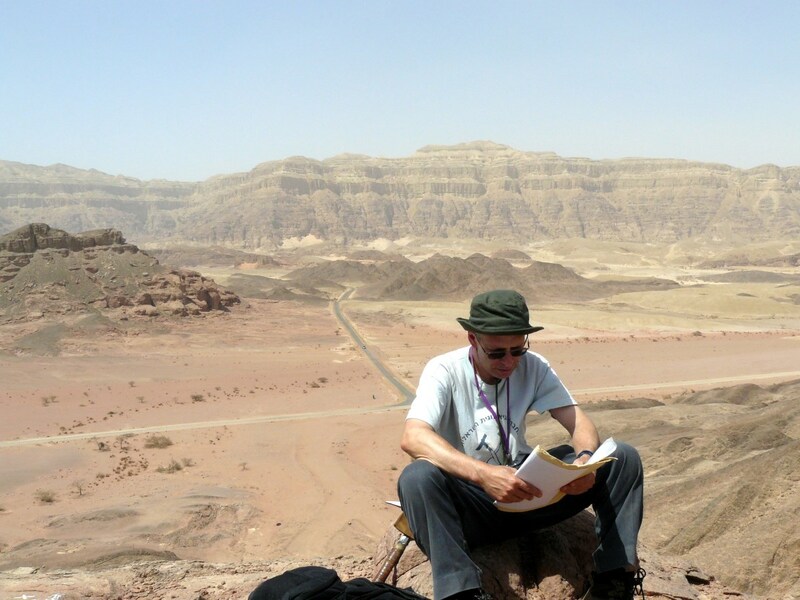 It's often difficult for us humans to comprehend just how big geological time scales are. Most of the time, a mountain range created by a continental collision is eroded away completely by the time the next rift comes along. This was the case along the eastern seaboard of the United States. The mountains created by the collosion of Africa and North America in the Carboniferous (the Alleghenian Orogeny) were almost completely gone by the Triassic, when the Atlantic Ocean began to form from a rift along about the same line. However, we have an example that might result in a qualified "yes" to your question, a little closer to the present. 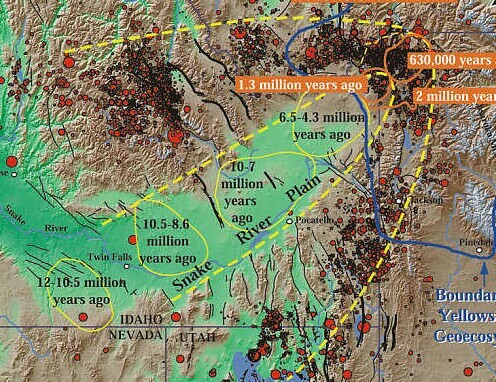 This is the way the Yellowstone Hotspot moved across what would become the northwestern United States. One of the things that caused geologists to recognize the Yellowstone Caldera was the 80km gap it melted in a mountain range it passed under, separating the Gallatin Range in the north from the Red Range in the south. The hotspot's track might just be the genesis of a new rift that breaks North America apart, given enough time and the right stresses. These mountains exist because of the plate movement. Divergent plate boundaries cause rifting, and the geomorphological expression of a rift is a valley. Valleys are, by definition, surrounded by mountains. The mountains that you see in the photographs could not have been there if there hasn't been a divergent boundary. The short answer is "no". 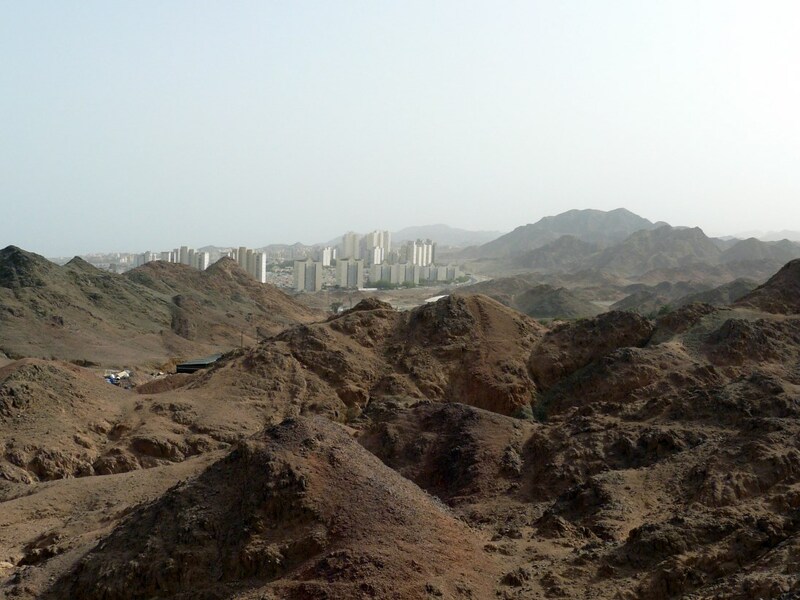 Erosion destroys mountains. Period. Not slumping, not faulting, not "flowing back to flatness" in the absence of compression, not sticking to a wayward plate. Just plain old, basic erosion. To fully understand the physics of rocks and the processes that lead to mountain building, you'd have to at least pick up a basic college level intro to geology. There are many good ones out there with awesome illustrations and clear explanations. On the other hand, simple videos can be useful too: You can check out these short clips from the British Geological Society for a basic view of mountain building at plate margins. To answer your question more precisely, the mountains that form at the edges of subduction zones are the result of several processes: 1) regional uplift of the overriding plate inland of the subduction boundary, 2) building of accretionary wedges from scraped materials off the subducting plate 3) Emplacement of island arc magmas as either extrusive (lavaflows) or intrusive (deep underground) plutons, and 4) Erosion, which cuts the deep channels through inherent structural weaknesses in this enormous mass of uplifted volcanic rock, exposing the sharp peaks and prominent ridges that we associate with mountains. Does reversing this subduction effectively stop these processes? Yes...sorta. And this has happened around the planet frequently enough over 4.5 billion years with the creation of at least to supercontinents, Gondwana and Pangea. I say "sorta" because the uplift is still there and the erosion continues unabated. Does reversing the subduction effectively reverse these processes in any way? No. Reversing the direction of India's movement into Tibet will not cause the Himalaya to slump back onto the sea floor. It's now chemically altered, bullet-hard, de-watered metamorphosed accretionary wedge. Only the steady grinding of glaciers and weather are going to "destroy" those mountains; the same process already occurring. Will reversing South American subduction cause the Andes to "stick" to the Nazca plate as it's pulled back out from under South America, or slump back into the ocean? That would impose a strength to oceanic crust that it doesn't have. If anything, in this new "extensional regime", oceanic crust would simply weaken, be uplifted by a shallow aesthenosphere, and likely be perforated by a mid-ocean ridge, or hotspots. Hope that helps! Mountains tend to fault and collapse back to flatter ground once the building forces cease. This is a very slow process and rarely leads to the complete elimination of a mountain range. So, left on their own, mountains tend to flatten, however, mountain ranges rarely completely disappear certainly not from these forces alone. 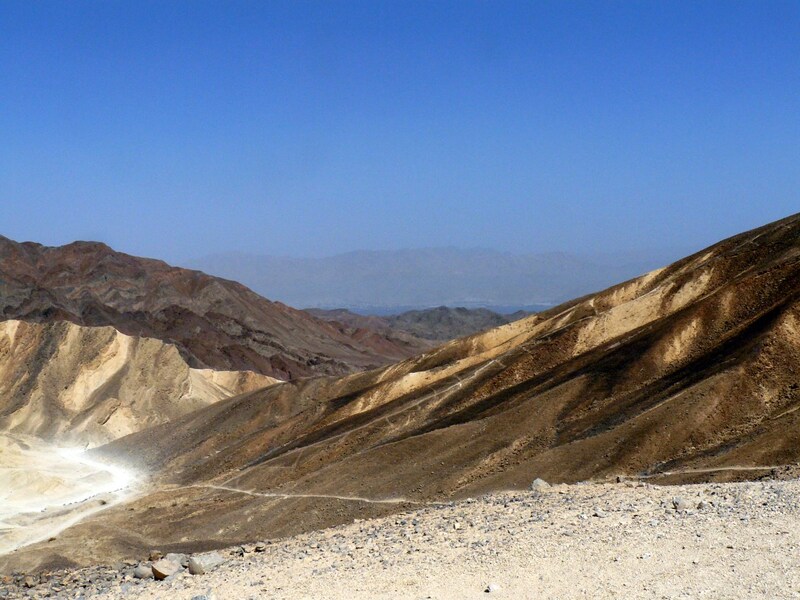 Even the oldest mountain ranges tend to leave behind traces like hills and highlands. That is not to say they cannot be destroyed but it tends to require an extreme event like being trapped under an ice sheet or a second later mountain building event. 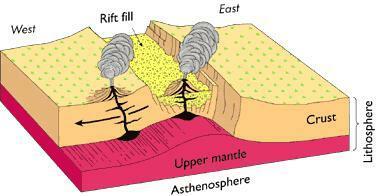 If a continental crust slips over a divergent boundary, underplating occurs. This is why most of the western USA is elevated. The forming east pacific plate is too new to sink back down so it gets welded to the bottom of the continental plate, pushing it upward. This process can stop a spreading center. However, the underlying forces in the mantle remain, so a new spreading center may form somewhere else. The new spreading center is formed wherever the rock breaks more easily. The thicker mountainous crust is generally harder to break than normal continental crust. So the spreading center tends not to form under mountains. A new spreading center that forms under a continental plate creates a rift valley which can become more mountainous than the surrounding crust, OR, it can end up thinner and more rugged, which depends on how fast the crust can move away from the upwelling. Not the answer you're looking for? Browse other questions tagged plate-tectonics mountains tectonics orogeny or ask your own question. How are small mountains created? Can we see lava in a divergent tectonic boundary?